I've been waiting to do this, and I've even considered NOT doing this. I don't take any glee in calling out my fellow bloggers -- okay, maybe just a little -- but I just can't hold it in any longer. Craig Monroe hit a majestic homerun last night in Yankee Stadium, a homerun for the ages -- which in recent Tigers history isn't saying much, but it certainly should go down as one of the most important regular season homeruns for the team in the past 15, 20 years. No, that's not an overstatement -- because I said so. He should be, barring anything unforeseeen, the Tigers' everyday leftfielder. But contract-wise, he's locked up for this year only. The Tigers plucked him off waivers from the Texas Rangers in February 2002, and now have, in my eyes, a gem on their hands. Monroe has the ability to be a solid number five or six hitter in the lineup. He can even handle the cleanup spot on occasion. His power and strength are impressive. He's even cutting down a tad on the strikeouts, which never hurts. So Dave Dombrowski better stop fiddling around and keep Monroe in a Tigers uniform for years to come. He has the strength to muscle the ball over Comerica Park's distant walls in left and left-center field. He doesn't drop the ball with his glove, and can throw it with some accuracy and zip. He is also another rarity among Tigers players of late: he is not baseball stupid. Now I like Greg as a writer, and I like Craig Monroe, but I can’t agree here. Monroe’s production is fairly typical, not extraordinary. He has two more years of arbitration eligibility and there is no need to sign him to a long term deal. I love his work ethic, his attitude, and I have no desire to see him leave. However, he is probably also one of the more replaceable players on the roster. If anyone would like to replace Craig Monroe on the roster this morning, they should have their Old English D torn off their shoulder. With all due respect to Billfer, who's clearly one of the most well-informed Tigers bloggers on this planet (plus I'm seeing him Tuesday at Comerica Park for Tigers Bloggers Night and I don't want him to punch me in the face), Craig Monroe didn't have the reputation for being Mr. Cool Cat in the clutch back in February. But he did have the credentials to have that potential. What Monroe did last night was nothing short of amazing. It was just the latest in a string of late-inning heroics for him, but it was without doubt the most stunning and important. He jacked a breaking ball (no, Mike Rosenberg of the Freep, it WASN'T a fastball) well over the wall in left field to turn 2-3 ninth-inning, two-out deficit into a 5-3 win over the Yankees. Storybook stuff, because it's been oh-so-difficult for the Tigers in the past few weeks. Not only do they need wins, they needed this kind of win in the worst way. Perhaps this can jump-start them back into their earlier winning ways. The team could use a little 6-2 or 8-4 stretch right now to keep the pesky White Sox and Twins at Tayshaun Prince-arm's length. As for Billfer, I've been surpressing this kind of post for a while, my friend. But Monroe's homer last night beat it out of me. Be nice to me on Tuesday. The Tigers and the Yankees, for all the years they spent together in the AL East, rarely duked it out with each other for division supremacy. The Tigers seemed to be up during the years the Yanks were down, and vice-versa. The Yankees hung around in 1972 before fading down the stretch -- the year the Tigers won the division on the season's final weekend. And in the strike-shortened 1981 season, the Yankees again were semi-serious contenders for the second half title before giving way to the Brewers and Tigers (Milwaukee won). But other than those two years, the Tigers and Yankees have been stretch run strangers. There's gonna be a showdown in Yankee Stadium Tuesday-thru-Thursday, and while it doesn't have divisional or pennant implications, it's still the most important series the Tigers have played against the Yankees since ... 1961. No joke. The Tigers were the Yankees' only true competition in '61. They matched the Bronx Bombers win-for-win, homerun-for-homerun. These were the Yankees of Mantle and Maris -- plus another bunch of thumpers -- but the Tigers had their own Murderer's Row of Norm Cash, Al Kaline, and Rocky Colavito. It was the Yankees, actually, who did most of the chasing that summer. Then came a showdown -- that word again -- series at Yankee Stadium Labor Day weekend. The Tigers went into New York 86-47, and 1 1/2 games behind the Yanks, who stood at 87-45. What followed was ugly. The Tigers got swept in the Bronx, but it wasn't just that they got swept -- it was HOW they got swept. Friday night, the teams played to a scoreles duel before the Yankees got a run in the bottom of the ninth to win, 1-0. On Saturday, the Yankees broke open a 3-2 game with four runs in the eighth, winning 7-2. And on Sunday, the teams played a see-saw affair before the Tigers went on top with a run in the top of the ninth to lead, 5-4. But Mickey Mantle led off the bottom of the frame with a homer to tie it, and Elston Howard slugged a three-run shot to win it, walk-off style. Yankees 8, Tigers 5. The lead was 4 1/2 games when the Tigers left New York, but the bleeding didn't stop there. They lost five more games in a row, while the Yankees kept winning. By the time the Tigers had snapped their eight-game losing streak, the Yankees had increased their lead to 10 games -- one week after the showdown series began. It was a sudden, definitive ending to what had been a wonderful pennant race. The 1961 Tigers won 101 games, yet still finished eight games behind the 109-53 Yankees. No split divisions or wild card in those days. No postseason, despite their spiffy record. If the Tigers get swept in New York this week, it certainly won't be as devastating as the 1961 sweep. But it won't be any less difficult to watch. These are the games that separate the men from the boys, don't you know. "I'm sure Jimmy Leyland will have his team ready," Yankees manager Joe Torre said yesterday of the Tigers -- 2006 version. Well, ready or not, here they come. Certainly, Jim Leyland has a good idea of what he's going to do with Mike Maroth when the lefthander's rehabilitation period is done, and he's ready to return to the Tigers' active roster. For sure he has already tipped his hand, at least to GM Dave Dombrowski -- if not to Maroth himself. Here's to hoping that Leyland's decision is to insert Maroth into the starting rotation, replacing the struggling rookie Zach Miner. Miner is fading, and a return to the bullpen is in order for him. But toss Maroth into the fray, and take your chances with the young veteran. Such is the free advice offered by another riff-raff blogger. But it's sound, I believe (naturally). No need in trotting Miner out there every fifth day, in the heat of a pennant race, when you have the more experienced -- and lefthanded -- Maroth available. Miner's ERA since the All-Star break is around 7.00. He is laboring more and more in each start, it appears. The team yanked Chris Shelton away from the fire to correct his swing. Perhaps the same treatment can be afforded to Miner -- shy of sending him to Toledo, however. There would be absolutely no shame for Miner if he would be pulled from the rotation. He rescued the team, in a way, when he was recalled from Toledo to replace Maroth in May. Under the circumstances, he's done a whale of a job; it could have been a lot worse, after all. But it's time for him to step out of the rotation and let Maroth do his thing. Yesterday I wrote how important Leyland will become in September. One of his most important decisions, I believe, will be to iron out the fifth starter dilemma. My vote is for Mike Maroth. Isn't the manager lucky to have me around? Jim Leyland likes to talk about how he has very little to do with the Tigers' success this season. He's humble to a fault, causing eyes to roll because it's just not believable that he could have such little impact on his players' overall performance. Yes, a manager must have talent to have a chance, but more talented teams than the 2006 Tigers have missed the playoffs -- many times because their leadership has been unable to mold it properly. The Tigers will soon begin their most important September in 19 years. That's when they last made the playoffs, in 1987. In no other September since then have the games meant as much as they will next month, when every at-bat, every pitch even, becomes magnified. It's a task that can be daunting to teams with a question mark in the manager's office. Leyland is no question mark. He's been through all this before, many times over. He's been to several NLCS, and won a World Series, as a manager. Despite his humility, Leyland will have influence over this pennant race like you won't believe. And his players know it. Their manager is the unquestioned boss, and right now 25 minds have been molded into playing Detroit Tigers baseball "the right way." 25 men are committed and united in a common goal. 25 men will have the right approach in September, because their manager will see to it. The Tigers will lean on Jim Leyland like never before, in September. He will be their rock, and their calming influence. He won't allow them to get too down after a loss, or too high after a win. It all comes down to experience, that ancient sports word. But no less important. Having a manager who's still wet behind the ears wouldn't serve this team well right now. 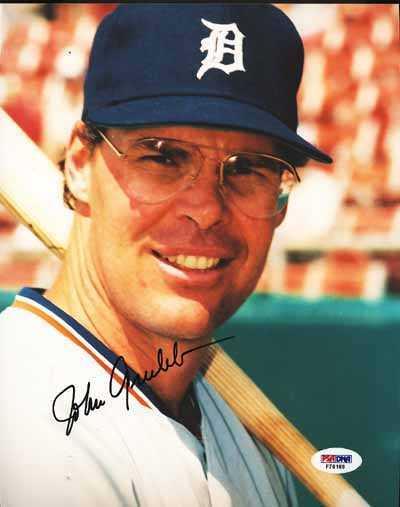 The Tigers could certainly win the AL Central right now if their manager was Alan Trammell, for example. They could win it without Jim Leyland's steady hand at the wheel. They could win it despite not having someone in the dugout who's been through this as many times as Leyland has. They could. But isn't it nice that they won't have to try? Jim Leyland says sometimes the biggest outs of a game can occur in the first inning, or the third, or the fifth. He said it in direct relation to last night's 7-1 Tigers victory, but it would have rang just as true if he had said it any other time, because baseball games are full of key moments -- and they don't always happen in the late innings. The key moment last night may have, indeed, occurred in the very first inning. Jim Thome was sitting on a 3-0 count, with a runner on first base and one out. He thought he had taken ball four. But third base umpire Dale Scott ruled that Thome had swung at the pitch. Back into the batter's box, Jim. He fouled off the 3-1 pitch, then struck out swinging. After the strikeout, baserunner Tadahito Iguchi was caught stealing. End of inning, just like that. So why was that so crucial? Had Thome walked, runners would have been on first and second with one out. And starter Justin Verlander, who's struggled mightily against the White Sox, might have had some thoughts creep into his head. The last thing the Tigers needed last night was a slow start. It was the first inning, but it was an important part of the game. And what's up with Sean Casey? This guy has been nothing less than an RBI machine since being acquired from the Pirates at the trading deadline. Casey doesn't try to do too much -- he just swings at strikes and drives the ball. And it's been working. He's getting an RBI for every four at-bats, roughly, for the Tigers. And Casey had another big hit last night -- a two-run double that erased a 1-0 deficit. Suddenly, with a healthy and productive Dmitri Young, Casey, newly-acquired Neifi Perez (a switch-hitter), plus Carlos Guillen and Curtis Granderson, the Tigers don't have to shrink anymore against righthanded pitchers. The glass is always half full with the Kool-Aid after a win. And a 6 1/2 game lead looks so much better than 4 1/2, doesn't it? It's all a matter of perspective, really. The last time the White Sox were in town -- July 18-20 -- the Tigers' lead was 4 1/2 games. It seemed sizeable, because it was growing. After dropping Game 1, the Tigers rebounded to capture the next two games, each punctuated with turning points that will not soon be forgotten. In Game 2, Craig Monroe's grand slam woke up a slumbering office and carried the Tigers to victory. In Game 3, Marcus Thames took out Sox second baseman Tadahito Iguchi, breaking up a double play. The inning stayed alive, and the Tigers scored the winning run. When Chicago left town, the lead was 5 1/2. The same as it is this afternoon. But fans around here were thrilled that the lead was getting larger. Today, the Tigers' 5 1/2 game lead doesn't impress quite as much. Maybe it's because two weeks ago tonight, the Tigers had managed to balloon their advantage to 10 full games. Maybe it's because they've lost nine of their last 12 games. Maybe it's because the Tigers are 3-9 vs. the White Sox. Maybe it's because they dropped the final three games of the Texas series -- unable to get a key hit to save their souls. Or maybe it's because we've seen teams wilt in the August heat many times before. I'm not going to rehash those chokers -- been there, done that on this blog -- but suffice it to say that larger leads have been lost in lesser amounts of time. The Tigers, I think, will do well to have the White Sox visit this week. Instead of being afraid to face your stiffest competition, embrace it. Get caught up in the moment. And remind them that YOU are the one being chased, not the other way around. Word is the Sox puffed out their chests a bit after sweeping the Tigers out of Chicago recently. But since then they've also gone 3-4. They've lost seven more games off the schedule, and haven't gained any ground. The Tigers can whack off four more games with the same result if they split this series with the White Sox at CoPa. And the 5 1/2 game lead will look better on Friday morning than it does this afternoon. You've heard of the term "Playing NOT to lose, rather than playing to win", correct? The theory goes like this: a team will be so concerned with maintaining a lead, that it will play too safe, thus enabling the trailing team to come back. It's also known, frankly, as choking. This seems to be the prevailing theory among the ink-stained wretches and blabbermouths on talk radio, unfortunately. "Even if the Tigers just go 21-20, they'll finish with 100 wins!" First of all, that's true; the numbers don't lie. A 21-20 finish will indeed put the Tigers at 100-62 for the season. And, granted, if 100 wins doesn't make the playoffs, then something's whacked. But let's examine this attitude/theory closer. 21-20 sounds great -- until you go into a slump. The Tigers are still battling their way through one as we blog. They're 3-6 in their last nine games. So what happens if they go into another mini-tailspin? To wit: let's say the Tigers go 4-8 in their next 12 games. All of a sudden, they'd have to go 17-12 to make the 21-20 mark. Do-able? Absolutely. But the point being, let's not get caught up in having them winning "only" a certain amount of games. Keep the foot on the gas pedal, I always say. The 1969 Cubs had a 9 1/2 game lead on August 15. That's three games more than the Tigers' lead currently, and it's only August 18. The Cubs ended up in second place behind the Miracle Mets -- 8 games out. They lost 17 1/2 games in a month and a half. Starting September by losing 10 of 11 games didn't help the Cubs' cause. If you think this can't happen to you, think again. Doubtless folks in Chicago looked at their Cubbies' spiffy 74-44 record in mid-August and thought, "Hey, if they play .500, they win 96 games! That should be good enough, right?" Now, all sorts of things contributed to the Cubs' collapse in 1969. A lot of things have to go wrong, granted. But 92 wins is still strong. It's just that the Mets started playing out of their freaking minds in September. The best way for the Tigers to make this AL Central/wild card race moot is to keep winning, to keep the baseball spikes on the throats of their chasers. Don't get sucked into having to play at "only" a certain clip the rest of the way. I doubt highly that Jim Leyland will allow that notion to prevail amongst his players; this warning is mainly for the fans and my fellow media types. Don't try not to lose this thing. Just go out and win it. I'm sure if Jimmy Leyland had his druthers, he would have decided to have Doug Mirabelli's bloop fall in for a hit, even though it tied the game in the late innings, rather than have Placido Polanco make an acrobatic, rolling and tumbling catch, thus saving the run. For Polanco is now out indefinitely with a separated shoulder, directly because of the catch that prevented the tying run from scoring in the seventh inning of last night's 3-2 victory over Boston. But good players only know how to play the game one way -- hard. So there was absolutely no doubt that when you saw Mirabelli's dying duck flutter into shallow centerfield, Polanco would do whatever he could to catch it before it hit the grass. He did, but may have taken himself out of action for the rest of the season, possibly including the playoffs. We'll know more after the requisite MRI is completed today. The Tigers can hardly bark at the injury gods. They've been relatively unscathed this season -- Mike Maroth and Dmitri Young notwithstanding. Both of those players' absences were filled admirably by teammates. And the extent of Polanco's injury -- since it's still unknown -- might not be all that bad after all. But even if Polanco is indeed lost for the season -- which is a distinct possibility -- the Tigers' goose is certainly not cooked. They've shown a resilience and esprit de corps that hasn't been seen in these parts for seemingly ever. They'll miss Polanco's bat-handling skills and patience at the plate, not to mention his defense. That's for sure. Still, hasn't the hallmark of these 2006 Tigers been the fact that there isn't any one player who has carried the team on his back? Isn't it true that if you asked 20 Tigers fans who the team's MVP has been this season, you might get half as many answers? The truth is, many different Tigers have taken turns being the team's MVP this season, sometimes for days at a time. The MVP award for this team is like a baton -- passed throughout the lineup. It's a distinction that's been borrowed by players, not owned. So it says here that even though Placido Polanco is no less a major part of the Tigers' resurgence than anyone else, the team can and will overcome his absence, one way or another. Already there's talk that GM Dave Dombrowski might look outside the organization for second base help, should Polanco's injury be major. It's a formula that has worked, so far, in the case of Sean Casey, when the Tigers needed a lefthanded bat. Get well soon, Placido. But just know that your team is greater than the sum of its parts. Last week I wrote of an imaginary train as an analogy to this AL Central race. The train was about to leave, I pontificated, and if the White Sox and/or Twins wanted to catch it, they'd better signal their intentions with a sweep of the Tigers. Each played them in a three game set last week. Well, the Twins couldn't manage it, but the White Sox did. And maybe even the Twins are on board yet, after a rare 1-5 week by our boys. Michael Rosenberg, bless his heart, tried to put a positive spin on things in today's Free Press when he correctly pointed out, from a factual standpoint, that the Tigers have the very same 5 1/2 game lead over the White Sox now as they did on the morning of July 21. Twenty-three days have passed, Rosenberg basically said, and the White Sox haven't put a dent into that 5 1/2 game deficit. Correct, but misguided. Factual, but flawed. Accurate, but shaky. Yes, the Tigers have knocked off nearly a month from the schedule and haven't lost any ground since July 21st. But do you REALLY think that makes them feel better this morning? Or the fans? There's still 45 games to be played (46 for Chicago). That's like having a four-point lead in an NBA game that has three minutes to play. PLENTY of time. And the White Sox won't have to rely on others for help, necessarily; they have seven games remaining with the Detroiters. So the "well, the lead is the same as it was 23 days ago" theory is nice, but not all that rock steady. It's the wet paper bag of defenses. Because the two teams seem to be headed in opposite directions. The Tigers need a victory -- any kind of victory -- in the worst way. Ugly, pretty, low-scoring, high-scoring, whatever. They just need a win. Can they get it in the cozy confines of Fenway Park this week? Pennant race, here we come -- ready or not! The Chicago White Sox cannot win the AL Central this weekend. They cannot pull into a tie. They cannot even get within a stone's throw of the lead. Unless they can figure out a way to make this series with the Tigers worth nine games, instead of three. But that won't stop the denizens around here from declaring this weekend's tilts at US Cellular Field on Chicago's south side "must win" -- for the Tigers. If you think that's an odd stance to take, considering the Tigers hold an 8 1/2 game lead on the Chisox, well there you have it. "Must" wins for the leaders. Can you imagine? But yet that's exactly how lots of folks around town view the Tigers-White Sox throwdown this weekend. "The Tigers have to win to show they can play with the 'big boys.'" "They haven't sold me until they play the White Sox on the road and beat them." The Tigers, in my mind, only need to win but one of three games this weekend to put a monkey wrench in the White Sox's plans for a Central title in 2006. That would give them a 7 1/2 game cushion. Still comfy. But even a White Sox sweep keeps the lead at 5 1/2, which ain't bad. The problem is, a Chicago sweep would give the Tigers a five-game losing streak heading into Boston, and that's why the fans would be a little nervous. Can't blame them, I suppose. The last things you want in August are losing streaks beyond four games. But this is the way it should be: mano-a-mano. Head-to-head. You, me, and NOT Dupree. The Tigers will be getting it on with the White Sox and the Twins a lot more before this season ends, which means ample opportunities for those teams to make up direct ground, instead of relying on help from their fellow American Leaguers. These are the games we all begged for in spring training. "Let's just hope the Tigers can play some meaningful games in August and September," our standards were in March. Well, here they are: meaningful games. It's August. And they'll get even more meaningful in September. Just a prelude to meaningful games in October, I'd say, but I'm getting ahead of myself (but not really). They are now, officially, the second-place Minnesota Twins. Far too early to cue David Bowie's "Panic in Detroit," but the Twins are now sole possessors of second place in the AL Central after taking two of three from the Tigers at Comerica Park. And they keep coming. They're 42-13 in their last 55 games. The Tigers' lead is 8 1/2 games -- still comfortable -- but the Twins, after losing their seventh straight at CoPa Monday night, showed that they're not about to project the Central race and call it for the Tigers. In 1984, when the Tigers ran roughshod over the American League, fingernails started to get nibbled on if the lead over the Blue Jays "dipped" to anywhere in the 7-9 games range. The Blessed Boys were figured to be "vulnerable" in that instance. Mostly it was shlock created by a bored media. Such shlock might surface now, the Tigers having -- gasp! -- lost two straight to the Twins. Ignore it. The Tigers would have to go on one of those 5-15 nightmares to allow anyone to catch them, and with their pitching, that just doesn't appear likely. If the Tigers face the Twins in, say, the ALCS, they might be in for a tussle. It's amazing, really, how much different the Twins are now than in May, when the Tigers blew them out of Comerica Park. In fact, if you minus Jim Leyland from Manager of the Year contention, you could do worse than select Ron Gardenhire for that honor. The Twins at one point sat at 25-33. Then they consumed jet fuel, and have been rocketing ever since. The Tigers will win the division. You can count on it. The Twins are just gonna make it a little more uncomfortable for them, that's all. And, Minnesota -- note to selves: don't start 25-33 next time. Then maybe you'll be able to contend for more than the wild card. This baseball season has turned thusly: it's no longer accurate to say it's only August 7. It's much more appropriate to say it's already August 7. As in, it's already August 7, Ozzie Guillen and Ron Gardenhire. Guillen and Gardenhire, managers of the White Sox and Twins, respectively, surely must have one thought and one thought only if they are to be anything more than wild card contenders: their teams have to sweep the Tigers this week to have a shot at this Central Division thing. The conductor is standing by the train, calling "All aboard!" Can those teams get their tickets punched in time? Only a sweep will give either the Twins or the White Sox a modicum of a chance at getting into the playoffs the old-fashioned way -- as a divisional champ. Anything short of that, and they're back to Wild Card Mania. In 1983, the Tigers were about 7-8 games behind the Orioles for the divisional lead in September. The teams had seven games remaining with each other. It was generally accepted that the Tigers had to win all seven to have a chance to catch the O's. After blowing the Orioles out at Tiger Stadium in the first of those seven contests, Baltimore recovered and beat the Tigers enough to keep them at arm's reach. "At least we had our chance," manager Sparky Anderson said. "It came down to us and them, which is all you can hope for." The '83 Tigers had no wild card to fall back on, of course. So maybe these games aren't quite as important to the White Sox and Twins -- as far as the division goes -- as you'd might expect. By all rights, I should be at the Tigers game this afternoon. But then again, that tradition hasn't been upheld since the early 1980's, so maybe I shouldn't be there "by all rights." Let's just say, once I used to be there on this date. Today's my birthday, #43, and I don't bring that up to be gratutious. But from 1973-1980, that date -- August 6th -- was a date on which my parents took me to a Tigers game. It seems like the Tigers played at home on every August 6, because I don't ever recall going on August 4th or 5th or 7th. Always the 6th. And, I was always allowed to invite a couple of friends. It was a grand tradition. 1973: The first and maybe the best. The Yankees are in town on a Monday night. Actor George C. Scott, a Detroit native, talks it up with Jim Simpson and Tony Kubek prior to NBC's Monday Night Baseball telecast. The Tigers are behind in the ninth, and tie it up on newly-acquired Frank Howard's homerun. Then they win it in the tenth. Good stuff. 1974: Interesting, in retrospect, because I end up witnessing Norm Cash's and Jim Northrup's last at-bats as Tigers. The next day, Cash is cut and Northrup is traded to Montreal. I don't even remember who won the game, and I'm not going to cheat and look on www.retrosheet.org, either. 1975: Wonder of all wonders. The Tigers are in the middle of their celebrated 19-game losing streak. The Orioles are in town -- Northrup is with them by now -- and unbelievably, Brooks Robinson drops a simple foul popup. Brooks Freaking Robinson. The Tigers lose, of course, and Northrup hits a homerun. But I saw Brooks Robinson drop a popup. a few days later, my friend Steve Hall and I will see the Chisox in Toronto -- a trip to his relatives that is also part of my birthday present. And in Toronto, outfielder Ralph Garr of Chicago loses his bat after a swing, and the flying wooden object crowns a kid in the head. Several innings later, the kid returns, his head bandaged, triumphantly holding Garr's bat aloft. The crowd goes bananas. 1979: The only birthday doubleheader. The Texas Rangers are in town for a twi-nighter (remember those?). For whatever reason, several of my high school classmates also attend the game, by coincidence. And several of us are in the same section. Weird, but fun. The tradition stopped after 1980, because I was about to enter college, and new traditions began -- and not all with my parents' blessing, or their knowledge. So I haven't been to a game on my birthday in 26 years -- and counting. I could have gone -- just attended on behalf of MCS Magazine -- but would that have been the same thing, really? The veteran hitter was scuffling along, playing in anonymity for a National League team, several years past thirty in age, his best years behind him, most likely. He had been a batting champion, though, and a strong MVP candidate in years past. He went to some All-Star games. Then the Tigers came calling, and there was a rebirth. He wasn't a one-man band, but he contributed greatly to the team's divisional title. The Tigers might have won the 1987 AL East without Bill Madlock, but it's doubtful any of them would have liked to try. The Tigers rescued Madlock from himself when they acquired him in early June, 1987, from the Los Angeles Dodgers. He was a career .300 hitter who was struggling to keep his head above .200. The Tigers traded a minor leaguer -- nobody of note -- to get Madlock, and almost instantly the acquisition paid off. The 36 year-old Madlock's numbers weren't terribly gaudy as a Tiger: .279 BA, 14 HR, 50 RBI in 326 AB. But he gave manager Sparky Anderson a much-needed right-handed bat, and a guy who knew how to hit. In fact, Madlock collected his 2,000th career hit as a Tiger. Sean Casey might be the lefthanded version of Madlock. Casey, too, is not being asked to carry the team. His presence is to be that of a reliable, .300 hitter who can fit in nicely with an already formidable lineup. Casey's a former All-Star, too. He, also, was a career National Leaguer before the Tigers nabbed him. (Madlock broke in with the Rangers, but only had 77 American League AB and about 6,500 NL ones). 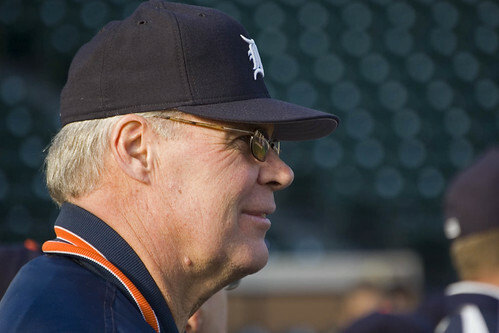 The Tigers of 1987 were put together by Bill Lajoie, one of the best sports executives to ever work in Detroit. Later in '87, Lajoie would author the famous/infamous John Smoltz-for-Doyle Alexander deal. That one also worked out well in '87, if you recall. Madlock later served as the Tigers hitting coach. First things first: let's get Sean Casey into the playoffs, then we can worry about whether he'll one day be the team's hitting coach. Altogether Now: We're Sorry, Brandon! I owe Brandon Inge an apology. But I'm hardly alone. I'd say there's about 200,000 others who ought to form a line and say, plainly, "I'm sorry." Inge could be adorned in a royal cloak and sitting in a baroque chair while we all did it, and that'd be totally appropriate. Inge fell out of favor with me when the Tigers were wooing Pudge Rodriguez to catch. At the time, the Tigers were coming off that horrific 43-119 season. It was in January 2004, and Inge started mouthing off to reporters who bothered to ask for his opinion -- and those that didn't bother. I can catch just as good as he can, Inge basically said. He was talking defense, of course, but because his bat was so weak at the time, his message got lost for an extreme lack of credibility. He came off, I thought, like a petulant child. He also indicated that he didn't want to do anything BUT catch, so...maybe Detroit wasn't the place for him. Good riddance, I thought. And said. Then Inge got shifted to third base, and it was as if the change in positions, the removal of the pressure to catch, was like a tonic for what ailed him at the plate. Gradually, Inge turned me. He went, in my eyes, from being a whiny, hitless baby to a very serviceable third baseman with some pop. In 2006, he's damn near up there as far as Most Valuable Tiger. He's turning himself into a fine third baseman -- maybe one of the top 10 in all of baseball -- and might hit 30 homeruns and drive in 90+ runs -- from the #9 spot in the batting order. It hasn't been talked about much, but Brandon Inge is one of the players currently carrying the Tigers on their backs. His BA, once in the low .200's, is now around .250. He's swinging with authority, and still playing some outstanding third base. Last Friday night, in a tie game in the seventh inning against the Twins in Minnesota, there was a Twins runner on first and nobody out. Prototypical bunting situation. Sure enough, it gets laid down -- an above average bunt -- and Inge races to field it. Then, in a play so typical of these Tigers' confidence and aggressiveness, Inge shunned the safe out and rifled a strike to nail the runner at second base by half a slide. One out, man on first -- instead of the go-ahead run in scoring position. That's the kind of baseball play that wins you ballgames. Sure enough, the Tigers scored in the 10th inning for a 3-2 victory. Sorry for thinking you couldn't be an everyday third baseman. Sorry for thinking you were whining in early 2004, when all you were doing, I realize now, was showing confidence in your abilities. Sorry for thinking you'd never be able to swing a major league stick. But instead of forgiving me and the others individually, maybe a mass act of forgiveness would be more appropriate. It'd take too long the other way, and we know you have some work yet to do.